MERCIA means Mijn Eenvoudige Relais Computer In Aanbouw, or My Simple Relay Computer Under Construction. It is a Dutch acronym for a project that started in June 2014 and aims to make a working and transportable relay computer. MERCIA is special, because it is entirely build out of relays and passive components (diodes, dipswitches, resistors and capacitors). No chip-based memory is used, the memory only consists out of diodes and capacitors or dip-switches. 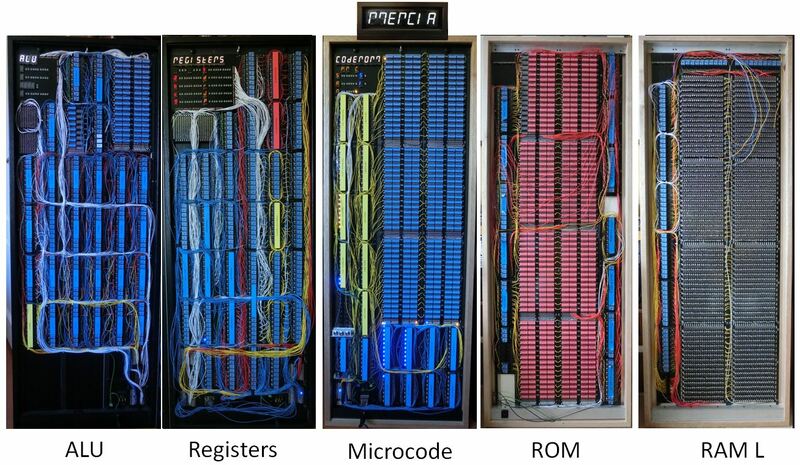 MERCIA will be implemented on nine panels. Each pair of panels - except the ROM panel - can be closed like a book and transported safely. MERCIA will be used to educate children and students about the working of a computer. MERCIA has design features that support this goal. First, a relay is chosen as primary switching element, because it is the most basic element. Everybody can understand its working principle. 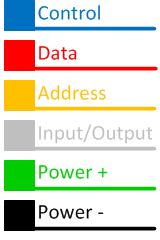 Secondly, attractive colors for different signals and components are used: blue is used for control signals, red is data, yellow resembles addresses and white I/O signals. Finally every panel contains a display in the top left corner that shows information about the working of the panel. On this site you'll find the technical description of the computer. A progress update on the project and build log can be found on facebook.